Hand-crafted silver bracelets great for Valentine's Day, Mother's Day or any day! Tradition. Much of the jewelry industry is based on cherished tradition. And over thirty years ago, a world-famous jewelry retailer initiated a new tradition by introducing extremely popular precious metal bracelet styles. Available with or without diamonds, there has never been a more generation jewelry design than a Hook-and-Eye bracelet. Now, Robert Manse Designs is offering these hand-crafted creations directly to the public, with the same luxurious quality you'd expect from an American-made fine jewelry product. With the help of business partner Novell Design Studio, Robert Manse Designs is introducing a collection of uniquely styled bangle bracelets inspired by the classic Love Knot and Hook and Eye series. 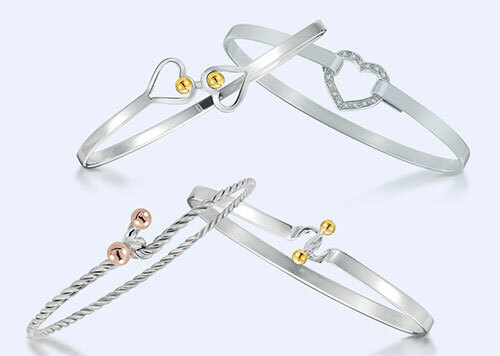 Fashioned with super-fine Argentium Sterling Silver and featuring diamonds or 18kt gold accents, Love Knot and Loving Heart silver bracelets do not easily tarnish. Smudges can easily be removed with a soft dry cloth. They are a perfect gift for any occasion, and last a lot longer than a dozen overpriced roses. With Valentine’s Day quickly approaching, this is your opportunity to purchase upscale silver bracelets at an attractive new price. Quantities are limited, so please visit our special silver bracelets information page to purchase right away!